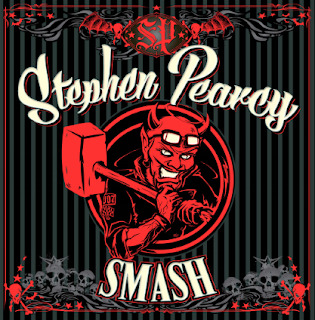 After the disappointment of Jack Russell’s Great White, I’m hoping that Stephen Pearcy fares better. I think (in the distance, somewhere near Milan) I can hear the bottom of barrels being scraped…. Best known as the original vocalist and founding member of the platinum rock band RATT, Stephen Pearcy has been working hard to complete his highly anticipated fourth solo album, while at the same time keeping busy performing shows across the U.S.
“I am very happy with the new music and the diversity of the songs. It's taken some time. I'm sure all the fans will be excited too,” says Stephen about the new album. “Smash” was mixed and mastered by none other than the legendary Beau Hill, the producer of RATT's first four albums, among many other hit records. Stephen will be supporting "SMASH" with live dates in the U.S. and internationally. With over 15 million records and gold and platinum long form videos sold in the U.S. alone with RATT, touring the world with over (20) albums to his credit with other ventures, solo projects, compilations, best of records, and other bands he created, there is no slowing Pearcy down. Beau Hill has weaved his magic over the years, but not even he has enough polish to buff this one into and decent shape. Give yourself a gold star if you thought I was going to say ‘turd’. On first inspection, Pearcy doesn’t sound too bad. I was flinching a in anticipation as some of the Ratt stuff I’ve seen on YouTube is rough to say the least. A good producer can obviously add some spit and polish to proceedings. Not possessing the finest set of pipes, he used them very well and to his advantage in the 1980s. He’s certainly made the best out of an average voice. ‘I know I’m Crazy’ comes off as a plodding grunge track, which would have been fine in 1992, but some 25yrs later, its off the mark by some distance. ‘Ten Miles Wide’ fares a lot better as it’s more in Ratt territory, but not quite there. ‘Shut Down Baby’ is a song that could have gone in a different direction with its decent sounding riff, but gets lost. ‘Dead Roses’ has a bit of a Velvet Revolver vibe and is the best of the bunch so far. ‘Lollipop’ is one of the worst named songs in rock history and screams ‘meh!’. Smash is aptly titled, as that’s what I’d probably like to do to it. Come on Frontiers, pull your finger out. I’m hoping Pride Of Lions wont let me down…. ?